Why should YOU join Alpha Phi Sigma? > Recognition of Achievement: The hard work and personal sacrifice that is required to achieve scholastic excellence deserves recognition. 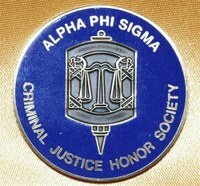 Alpha Phi Sigma membership designates an individual as an outstanding student of criminal justice. > Special Awards: Each year the national office awards a cash scholarship to one member. Awards are also given to students who compete in the Annual Call for Papers. > Annual Convention: A national convention is held each year. The convention is held in conjunction with the Academy of Criminal Justice Sciences (ACJS) and presents a wide range of programs and activities. > National Newsletter: Active members receive a biannual national newsletter, which reports on areas of concern to the criminal justice sciences and the society. > Alpha Phi Sigma is the nationally recognized honor society for students in the criminal justice sciences. To become a member, the student must have completed one-third of their total hours required for graduation and be recommended to National by the chapter advisor. o Undergraduate students with a declared criminal justice major or minor, must have a minimum of 3.2 GPA on a 4.0 scale. The student must also have completed a minimum of four courses within the criminal justice curriculum. o Graduate students must maintain a minimum of a 3.4 GPA on a 4.0 scale and have completed a minimum of four courses within the criminal justice curriculum. For more information, please contact the Chapter Advisor, Kim Hendricks or visit our OrgSync portal at https://orgsync.com/56711/chapter.